Josh Friedman (born 1967) is an American screenwriter best known as writer of the TV series Terminator: The Sarah Connor Chronicles and the 2005 film adaptation of H.G. Wells' War of the Worlds. Friedman also publishes the blog "I Find Your Lack of Faith Disturbing". After being offered an opportunity to work on a script titled Snakes on a Plane, Friedman posted a blog entry that sparked interest in the film on the Internet before the movie entered production. The same entry introduced a profane line that was added to the film when the cast reconvened in March 2006 to shoot additional footage. On August 1, 2013 he was announced as co-screenwriter of Avatar 2 with James Cameron. ↑ Friedman, Josh (August 17, 2005). "I find your lack of faith disturbing: Snakes on a Motherfucking Plane". Retrieved 2006-03-18. 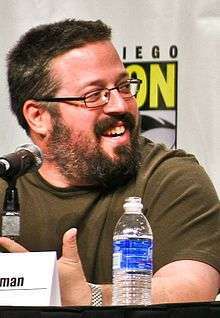 Wikimedia Commons has media related to Josh Friedman.